EDIT: Oh, yes ! Sorry. CT Update45. I just checked and it works fine with Update7 Hotfix - Just one or two offsets changed (money, tickets, bla bla) but I already have an updated version. But it shouldn't change something. Sorry but I'm out of ideas. 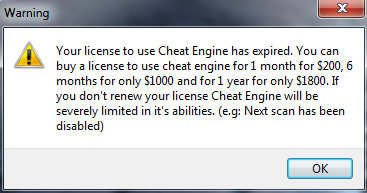 Try to restart the game then retry the CT scripts. Could it be that the configuration of my CE is involved? Because I managed to run the CT45, but then nothing .. I do not know what I could have done different this time. The scripts have been made on mono features and if for one or any reason you're not able to toggle a script, many chance that mono is not enabled (check CE Mono tab). Another scenario - if your CE has been closed (crash or else) while a script has been activated, and you open your CT again to reactivate that same script, you will not be able to do it because the game (memory) kept the previous parameter. The only thing to do is to restart the game, as I said before. Hello. I was able to run the CT Farm Data Base Addresses. Thank you for your help, Fantomas. I appreciate. On the other hand, I can not run the CT "NoWaitingTime (Ponds Contents)". EDIT: Oh, and do you plan to do a CT for the duration of the animals, too? On the other hand, I can not run the CT "NoWaitingTime (Ponds Contents)". Try in first to create a pond, add fish in then activate the script. Works fine here though. I do not know what it is that duration. But I'll take a look. [NoWaitingTime (Ponds Contents)] I managed to activate it in the CT, but it does not work. That's what I do not understand. Do not know why it is no longer working (maybe I copied the false code ) but this one works well. But yeah, I'll post a new update soon. It seems that this one does not work in Update 12 but that one from CT update 10 works perfectly! At least, I can confirm that CT update 10 works well on the latest game update 12.